Fantastic numbers for your split times, your final standing among female contestants and among all the racers! Your consistent training plan worked.You were able to assess what was happening during the race and think through a new strategy…your intelligence helps you be a great runner. The icing on the cake was you had a blast. We love following your running career. Thanks Mom! I feel really happy with the way the race went for me and it makes me look forward to Phoenix in February! Thanks for your support. That’s a great finish time – congrats! After that, I’d be dreaming about that 10 minute marathon PR, too! Fantastic! So wish I could have been there. 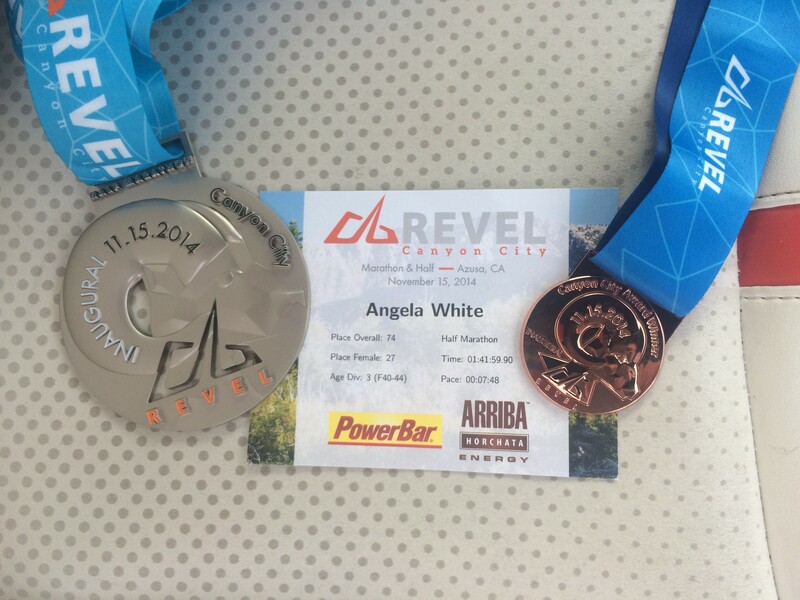 I ran Big Cottonwood, and Revel sure puts on a great race. I agree — Revel puts on a great race, and I never would have known this was an inaugural event. I was very impressed and have already recommended this race to friends! Big Cottonwood looks equally as gorgeous. I hope you’re right about that BQ! Thanks for your support. WooHoo – great job on the huge PR!! Love when you are feeling so good at your check points that you don’t feel the need to slow down – awesome!! What a fantastic time!!! Congrats! I have good feelings about Phoenix for you!!!! I smiled reading this entire recap. : ) You looked amazing out there, SO strong at mile 12. And I’m thrilled I got to give you a hug in the parking lot. I’m SO proud of your accomplishment! What a great race. I’m definitely putting Revel on my list. From the few full marathoners I knew running that course, they said it was a fast full course but they thrashed their quads on the downhill. 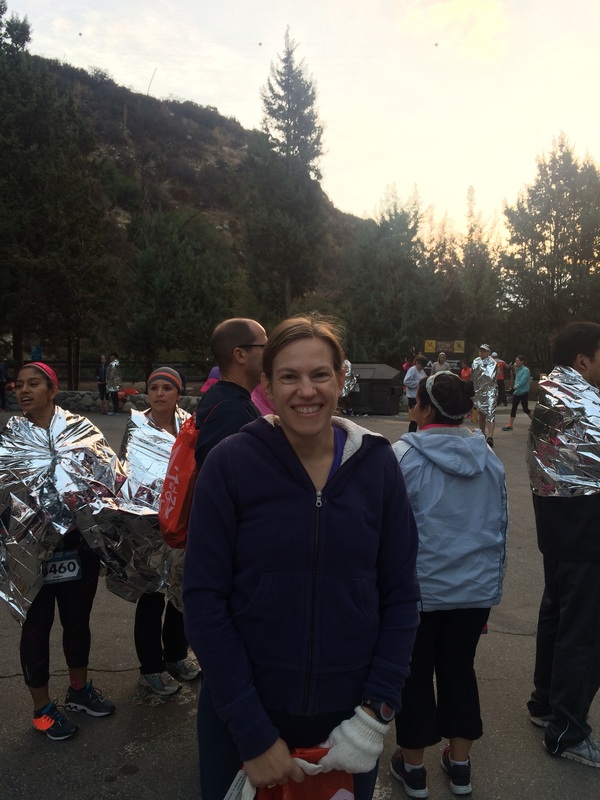 Loved your positive race recap! I am racing the revel canyon city half this November and was looking for an idea of how steep/long the uphills are. Do you think it would be necessary to do some hill repeat workouts to prepare? Thanks Kenzie! I do think it is very helpful to do some hill repeat workouts to prepare for Revel Canyon City. I would do hill repeats in place of one of my speed workouts, and I would run a relaxed pace up the hill and practice downhill running on the way down (quick and light steps with just the right amount of lean – not slowing myself down). This worked both to help me on the uphills and on the significant elevation loss. Refreshing my memory with the elevation map: https://www.runrevel.com/rcc/course it looks like there’s a uphill grade from around mile 1 to 3.5ish that goes up 200 feet over those 2.5 miles, and one that felt bigger but probably just because it’s later in the race at mile 6 to mile 7 that went up 100 feet in that 1 mile. It’s a pretty slight grade and probably actually helps your legs a bit by changing up which muscles you use, although that’s not what I was thinking at the time. 🙂 I just tried to keep a consistent *effort* rather than a consistent *pace* on the hills. The payoff of course is all that downhill. I would also recommend doing some strength training if you don’t already, even just 2 sessions per week of 15-20 minutes each would make a big difference — wall sits and planks and squats. Good luck!